This is Percival's Medal Index Card. 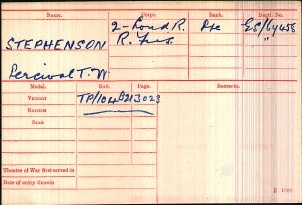 I originally got a black and white copy from microfilm at the National Archives in London. 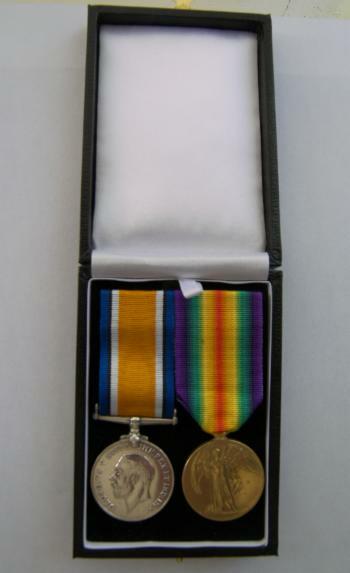 On 5th July 2008 I was given my great-uncle's 1st World War Medals. 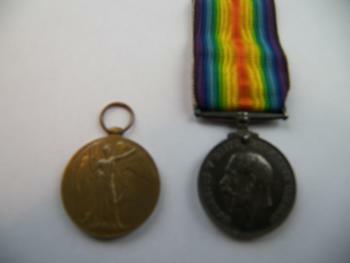 After nearly ninety years, they were a bit grimy and the ribbon for the Victory Medal was on the British War Medal. After asking for advice on a family history forum, I sent them to Just Medals in Surrey. Mr Richard Rosser was very efficient and returned them cleaned, re-ribboned and mounted in a presentation case. A very good service at excellent value. The National Archives has a very good section on their website that discusses Medal Index Cards and Campaign Medals for the 1st World War.